Energy-efficient technologies are an increasingly relevant policy priority, given growing consensus on the need to tackle climate change. This column examines the productivity benefits of adopting one such technology – LED lighting – for manufacturing firms in India. It finds that improved productivity resulting from LED lighting’s lower heat emissions makes adopting such technology far less costly than previous anticipated, particularly for labour-intensive firms in hot climates. Innovations in energy efficiency have been cited as a primary means to curb the acceleration of climate change. Despite this promise, energy-efficient technologies are consistently adopted at low rates. Given the repercussions of rising global temperatures due to climate change, and the startling rate of growth of global energy demand, achieving high adoption rates of technologies that mitigate climate change is a key policy priority. Recent research points to information frictions, or a lack of salience of information, as key determinants of this ‘efficiency gap’ – if individuals and firms knew the true returns to investment in energy efficiency, or if information were made more salient, widespread adoption of these technologies would occur more quickly (Allcott and Greenstone 2012). In a recent paper, we provide evidence for a hidden productivity benefit of a commonly used energy-saving technology that, when properly accounted for, dramatically alters cost-benefit calculations for adoption (Adhvaryu et al. 2015). We study the replacement of standard fluorescent lighting with light-emitting diode (LED) bulbs on garment factory floors in India. This additional return to LEDs (above the energy cost savings) is based on the idea that worker productivity suffers at extreme temperatures. Since garment factories in India are rarely temperature-controlled, the temperature experienced by production line workers on factory floors is determined in large part by outdoor temperatures. So all else equal, on hot days, productivity is lower compared to slightly cooler days. It turns out that LEDs, in addition to consuming about 1/7th of the energy of fluorescent bulbs, also emit about seven times less heat. We show that the reductions in heat dissipation that occurred when LEDs were installed reduced the temperature on factory floors by several degrees, which led to an increase in productivity. About one half of the fluorescent bulbs on the sewing floors of 26 factory units operated by a large garment manufacturing firm in India were replaced with LED bulbs over the course of three years. The timing of the factory-wide replacements was largely driven by changes in international buyers' recommendations regarding environmental sustainability for their suppliers. In our study, we estimate the extent to which the introduction of LED lighting (through the reduced dissipation of heat on factory floors) augments the temperature-productivity gradient. We find that LED installation has a large impact on hot days, when heat stress reduces worker productivity most – there is almost no impact of LEDs on cooler days. The reason that LEDs augment only the top of the temperature-productivity gradient (for hot days) has to do with the fact that the gradient itself is non-linear. In Figure 1, we graph outdoor temperature against efficiency, which is a standardised measure of worker productivity, using data before the installation of LEDs. As the figure shows, the relationship is fairly flat up to a ‘wet-bulb’ temperature of about 19ºC, which corresponds to 27-28ºC at average humidity levels in this context. But above this cut-off, productivity declines severely with temperatures. On the hottest days, productivity is 6-7 efficiency points or about 13% lower than average productivity on days below the 19ºC cut-off. 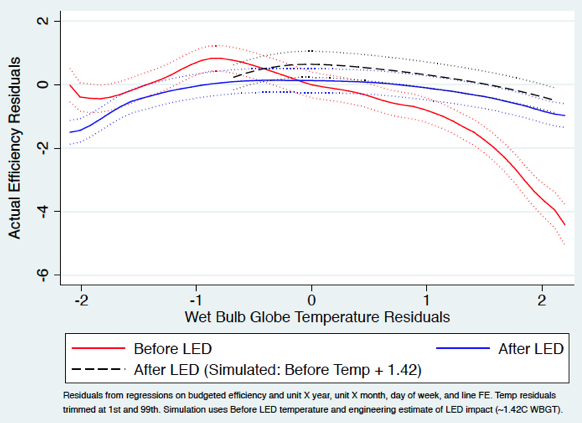 We commissioned an engineering study that found that bulb replacement with LEDs likely led to a reduction of indoor temperature by about 1.4ºC, and that this reduction was approximately constant across the temperature distribution. The reason mitigation through LED installation was larger where the temperature-productivity gradient was steeper is then made clear – the introduction of LEDs constituted a movement leftward along the gradient, and this movement generates large increases in productivity in high temperature ranges, and small productivity increases elsewhere. These results are summarised in Figure 2. 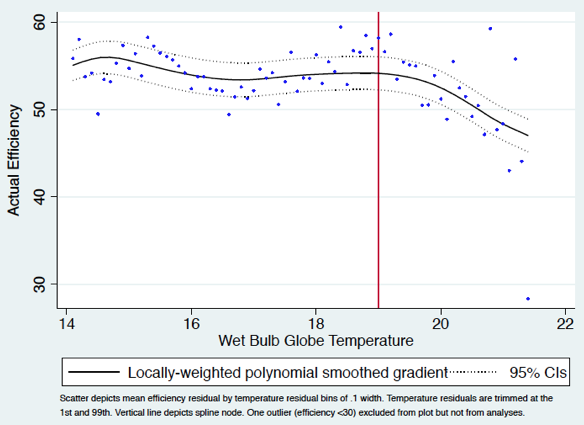 The red line is the relationship between outdoor temperature and productivity before LEDs, similar to what is graphed in Figure 1. The blue line is the same relationship after LED introduction. As is evident, the blue and red lines look fairly similar at low outdoor temperatures, but begin to diverge at higher temperatures. Before LEDs were installed, workers were very sensitive to high outdoor temperatures. Each additional degree on hot days spelled a decline in productivity. In contrast, after LED installation, that gradient becomes much flatter, even at high temperatures. The dashed black line shows the changes in the outdoor temperature-productivity gradient implied by the engineering report’s calculations regarding average heat reductions from LED installation. As the figure shows, this implied change in the gradient lines up very well with the observed changes. We perform cost-benefit calculations for LED adoption, combining the above estimates with the firm's actual costing data for LED replacement and actual energy savings over fluorescent lighting. The results of this analysis show that the productivity co-benefits of LED adoption are substantially larger than the energy savings. Indeed, accounting for productivity increases dramatically shifts the break-even point for the firm from over three years to around seven months. In hot climates, LED lighting is much more affordable than a naïve comparison of energy cost savings would suggest. Installation of LED lighting is in the best interest of manufacturing firms that rely heavily on manual labour, even if they have relatively short time horizons to recoup their investments. This fact has important policy implications for developing countries in particular, which tend to have hot climates and produce much of the world’s manufactured products. Greenhouse gas emissions are rising substantially faster in developing countries compared to the developed world. As many recent climate talks demonstrate, financial constraints that hinder green technology adoption are especially difficult to overcome in these contexts. Demonstrating and disseminating the profitability of LED technology adoption is a crucial task for policymakers interested in promoting climate change mitigation. It is also imperative that researchers and practitioners alike identify a broader set of green technologies that may have hitherto undiscovered productivity benefits, and quantify these potential benefits rigorously. Adhvaryu, A., N. Kala and A. Nyshadham (2015), “The Light and the Heat: Productivity Co-benefits of Energy-saving Technology”, PEDL Research Note. Allcott, H. and M. Greenstone (2012), “Is there an energy efficiency gap?”, Journal of Economic Perspectives 26(1): 3–28.